A major component of history, tradition and identity, gastronomy has also become a major motivation to visit a destination. According to the 2nd UNWTO Report on Gastronomy Tourism, this tourism segment “offers enormous potential in stimulating local, regional and national economies and enhancing sustainability and inclusion”. The Report was presented in the recent 3rd UNWTO World Forum on Gastronomy Tourism, held in San Sebastian, Spain in cooperation with the Basque Culinary Center. 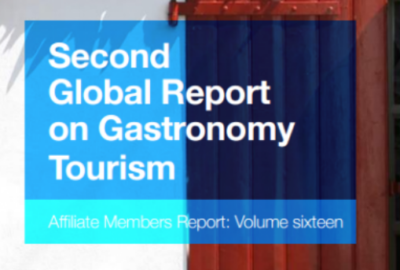 Sixty good practices in Gastronomy Tourism from different countries are showcased in the 2nd UNWTO Report on Gastronomy Tourism, touching on issues such as seasonality, training and innovation, ICT-related initiatives and wine-related itineraries. The publication stresses that in terms of tourist motivations, experiencing gastronomy is now at a similar level to visiting a museum, enjoying music and admiring the architecture of a destination. In this sense, gastronomy tourism has strong potential to improve destination management, promote cultures and contribute to other sectors such as agriculture and food manufacturing.